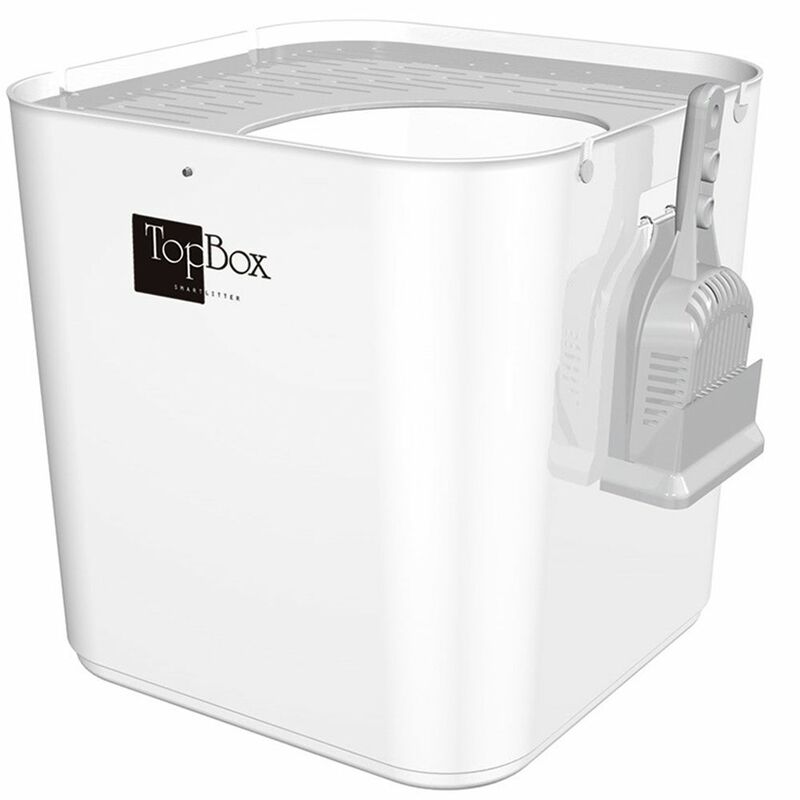 The Top Box Cat Litter Tray with its top entry is the ultimate innovative solution if your cat naturally looks for higher places, corners or boxes. This smart Top Box has a modern design and is made from high-quality white plastic that will fit in perfectly in any room. This litter tray is particularly spacious, offering your cat more room and more privacy, even for larger breed cats. The special design ensures clean surroundings as, even if your cat loves to paw and scratch its litter, none of it will be thrown out of the box. The ventilated lid is also very practical, as it can be closed with the preΒ of a button and it also acts as a litter tray mat. When your cat jumps out of the box onto the lid, any stray pieces of litter hanging to its paws will fall back into the tray through the ventilation slits. This ensures your floor stays nice and clean. Included in this product is a practical scratch-resistant litter liner, which can be filled with litter to a depth of up to 8-10cm. The height of this tray means that your cat can also urinate whilst standing up. The grey hood can easily be opened for cleaning and the changeable litter liner can easily be lifted out using the robust hand-strap. This makes disposing of the used cat litter significantly easier. The liner is easy to clean and keep hygienic - simply wash with soapy water, allow to dry and use it again. A specially-designed litter scoop has been included to make it easier to remove the used clumps of litter, with special slits to separate clean and used litter. Keep the litter scoop handy by placing it inside its holder, which hangs on metal hooks inside the handle receΒes on the side of the Top Box. To get your cat used to this new litter box with its unusual top opening, simply place the Top Box in your cat's usual toilet spot. Most cats will hop inside straightaway. Top Box Cat Litter Tray at a glance: Modern litter tray with top entry, also suitable for large cat breeds Innovative design and sturdy construction: aesthetically pleasing, high-quality, spacious, practical and clean Fits into any room: as it does not look like a conventional litter tray Closeable lid with slits: works like a litter tray mat, ensuring that litter falls back inside the tray where it belongs, rather than sticking on your cat's feet and spreading around your home With changeable scratch-resistant litter liner: With integrated metal ring to firmly fasten the tray to the inner walls of the box With two stable handles for easy emptying and cleaning of the box Includes one litter liner. Further tray liners can be purchased separately With large, robust litter scoop with a multifunctional holder: this handy feature allows the scoop to be attached to the side of the Top Box, or wall-mounted, or kept standing up, ready to use More privacy thanks to added spaciousneΒ With open handles for easy moving For a clean toilet environment Ideal for cats that prefer to stand to pee Rubber feet to ensure the tray..
Price just £119.99! Click here to buy now!